Today I am sitting at the beach. The sun is shining brightly in an almost cloudless blue sky, the sea breeze is keeping us cool and the tide is heading out, pulling the water back towards the Isle of Arran, a long body of land in shadow front of us. Some kids are competing to cover themselves in as much sand as possible. Other kids are running full pelt into the freezing water. There is laughter, screaming, shouting, conspiratorial whispering. Out in the sea there’s a dad being too annoying for his kids, in that passive aggressive way that Scottish dads often are. I’m at the sea, and I’m mightily troubled. In fact, my grief is paramount. Grief at where we’ve gotten to in the world. It’s been this way for some time and I never talk about it here, or anywhere online. I remain silent here because I just don’t know what to say. Stephen Jenkinson talks about “being troubled aloud in troubled times” and maybe this is where I’m at. If I’m to be a proper elder and a good ancestor, I must vocalise some of my troubles and share them. It seems, anyway, that he has encouraged me to do so. But, oh, it all seems so vast : the troubles are so very troublesome. I’m troubled and outraged, actually. Where do I start? I woke early on Tuesday, processing the news from the day before about the racially-motivated, brutal murder of teenager Nia Wilson in America. She isn’t the first and sadly, shockingly, she won’t be the last – but I couldn’t get her and her family and the whole fuckery of it all out of my head. On Instagram, where I read the news, there was also a playing out of power, bullying and internet hijinks that in my take on the matter demonstrated white supremacy in action. Not the conscious kind displayed by the Klan and the tikki torch wielding neo-Nazis, but from a self-proclaimed white ally and the systems that support this behaviour. The turmoil of it all is coursing through my body. I can’t actually hold it in any longer. How can we be here, in this world, in all of its unjust, unfair, biased, fucked-up-ness and pretend like it’s all okay? How can we carry on with our day and think it’s okay because somebody else out there is doing the work? How can we carry on and think that we’re too busy living our life, doing our best, doing our own work? How can we continue to pretend like we’re powerless and it’s so overwhelming that we can only be silent – after all, what can we say? People – especially white people – we need to stop this. We need to stop this crazy tread wheel existence of being more, doing more, having more … we need to stop, look and listen. I don’t just mean that we need to address the inherent racism built into our system. Though, I do mean that. As well as addressing the inherent racism we harbour within – oh, even you and me, and we’re the ‘good guys’, right? I mean that we need to look at the whole picture. I mean we need to look at the state of the communities in which we live. I mean, we need to stop consuming – at the shopping centres, yes – and also in our churches, retreat centres, yoga classes and online groups. We need to call the systems we’re propping up to proper account. We also need to sit in the grief of the fuckery of it all, not drink or drug it away. Neither can we spiritualise it away. If we could CBD it NLP it away, it’d be done already, right? So many prayers, so much positive psychology! And still, this mess! We need to look to the world we’re part of and these very troubled times. 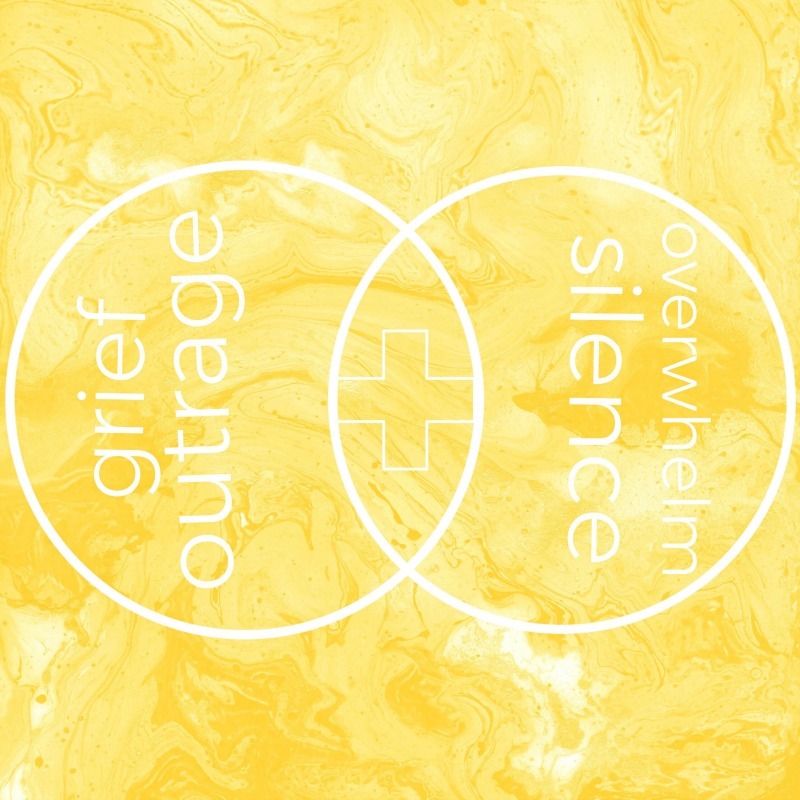 We need to break the silence, shift out of our overwhelm and face the trouble. It doesn’t actually require an instant solution from us. How could there be one? The first step, as I and others see it, is to admit it is so. There is inequity here in Scotland, that’s for sure. There is major fuckery going on around us all the time. And today, I can trace all the threads of all of those injustices coursing through the tapestry that is my life in this place and time, but this is not the place to lay them bare. Anyway, it’s all okay – David Attenborough has spoken and Starbucks have banned straws and we can all stand down! Well, here’s the deal. I’ve stood down for too long. I’ve been outraged and overwhelmed into silence for too long. I’m not the first to speak up. I remember when Rachael Rice started a series aimed at waking up white spiritual women – I didn’t read or watch any of it at first. I’d disassociated myself from ‘those’ white spiritual women some time ago. Okay, so I have been making many internal shifts, these last years, always fuelled by my inner disquiet with my personal life and the state of things outside. Last year, I finally managed to switch up my teaching offerings away from the old language of self growth and the paradigm of teacher-show-and-tell to something that makes way less money, but comes somewhat closer to who I am, what I believe and how I believe we can all operate in the world. I don’t think it’s as popular as show-and-tell was, though, so we’ll just have to wait and see how that unfolds…. Even so, I’ve remained so silent I’ve stopped sending emails to the folks who joined my newsletter list, stopped posting on my blog, and have been operating Facebook and Instagram light for ages now. This year, I’ve been focussed on finding out what it takes to be alive in these times and how it is to be an artist in these times. It’s brought me to my knees, more often than not. I’ve been in so much pain at times from a twisted pelvis that I couldn’t walk unsupported. I’ve written whole versions of myself into thought form, and let them drift away as the next tide of grief and overwhelm creeps in, unexpectedly and from the sidelines. That point in the middle of the vesica piscis above, though – the vulvic opening into wisdom, called the mandorla – that’s where the art is made. Our art is created from the tension and conflict of opposites we hide so shamefully in our quest to just get on with things and live up to the idea of who we are in the world, who we want to be and who we are yet to become. Right now, I don’t have any answers. But I know I can’t be silent anymore. I know there’s too much coursing through my mind and body about all that is wrong in my world – and yours – to contain it all here in this space. Like I said, the fuckery of it all is too vast to lasso into submission. Today, I won’t be overwhelmed into silence. At the same time, this may be the only outburst for months as I retreat back inwards to tend the grief and the rage. I don’t know. All I have is my offering here to say, I see all the fuckery and I sit here with you in it. It’s where my latest art emerges from. It seems small, perfectly inadequate – and yet – it’s all I have for now. All the while, I’m still thinking about the brutal murder of an eighteen year old woman called Nia Wilson, who had the wrong colour skin. Liked it? Take a second to support Julie Gibbons on Patreon! It may seem cliche , just one person making the smallest positive action is a ripple. are the ripples going as fast as we want? Think of how far we , the people of Earth have come just in the last 50 years. Where in American people of color, were not allowed to use the same restaurant or drinking fountain, their children could not attend the same school as white children. It may be slow progress, as each person starts to move forward in acceptance of each other, we are making change, It we get stuck in the despair that vib is echoed into the world. The more positive we each are that vibration will echo. I know I sound like the white wise woman drinking the kool aid, Making the change still has a way to go, please continue your work to help all on the path of healing. Your writing has expressed the very same thoughts of thousands of women, i feel sure. The tide is turning, i believe. All the bad stuff gets reported around the world, but there are a hundred thousand simple acts of care and love taking place every second. Know that love is stronger than any other emotion and rest easy. Our time is coming. Thanks for the love and good wishes. The good news is that I don’t rest easy in this, and am happy not to! I truthfully don’t believe it’s enough to work on the premise that there’s lots of love and goodness in the world, not just bad. Each of us has a responsibility to step up and call out the fuckery where we see it, not just amplify the love. This is something I’ve failed to do much of in the online/public arena, and am feeling the deep-belly and deep-hearted call to do so. I see more folk like me doing the same, but there is a long way to go! I’m so glad and grateful to hear your voice in this, Julie – thank you. Thank you for speaking your truth – for being troubled aloud in what are certainly troubling times. I feel it too and am awakening from my own version of amnesia and apathy proliferated under the mask of white liberal female spirituality – something I also don’t identify with yet nonetheless have been conditioned by in deep, unconscious ways. Love is essential and unquestionable – but as an aspirational concept or even a profound inner realisation, it’s not enough – Love needs arms, legs and voices to bring its form into a world that is crying out for action, real-life impact and change, radical truth-telling, the embodiment of integrity and the making of a proper stand for human equality, dignity and decency. There’s a New Wave coming… and I am so terribly late… yet I look around and see sadly, in wider contexts, I’m still early. But that’s the point and the work. The sadness and grief are undeniable. Thanks for being a voice for real in such unreal times. Thank you for sharing this post in all its messiness. The past few years, since Brexit, have jolted me out of my ease, as I realised that, to some people, I belong back home in the commonwealth country of my parents birth. It has led me to investigate the history of race in this country, and that of colonialism – something which Britain continues to reap benefits from. I have experienced grief and rage at my own ignorance, and begun to get to grips with the white supremacy embedded in our systems, and the proximity to whiteness that comes from being part of the model minority. I have a lot further to go on this personal journey, but I feel that – in the UK – there is a great silence, sweeping under the carpet and unwillness to face up to white supremacy and colonialism. It is easier to point the finger at the US. But, it is here too, in people and structures, just different. Hearing you say that, to break through the silence on this side of the pond, means a great deal to me. Thank you.